Take Current Affairs quiz March 12, 2019 to enhance your General Awareness. Practice with our esteemed Current Affairs quiz March 12, 2019 questions which covers all important events across India as well as World. Make use of all important Current Affairs quiz March 12, 2019 questions with answers updated here, at free of cost to succeed in all competitive Exams and Interviews. PM Narendra Modi inaugurated the new Pandit Deendayal Upadhyaya Institute of Archaeology at __________. Prime Minister Narendra Modi inaugurated the new Pandit Deendayal Upadhyaya Institute of Archaeology at Greater Noida in Uttar Pradesh. What is the focus of the 4th session of UN Environment Assembly 2019? The UN wants individual countries to sign up to significantly reduce plastic production, including a phasing out of single-use plastics by 2030. Where was the 50th Raising Day celebrations of Central Industrial Security Forces (CISF) celebrated? Where is the fourth session of the UN Environment Assembly held? The fourth session of the UN Environment Assembly has gathered in Nairobi, Kenya from 11 - 15 March 2019. Which of the following policy was amended by the Centre so that the State govt. can put the Enemy Properties to Public use? Surat Metro Project springs up expected to serve the masses by 2024. Jammu and Kashmir government to give monthly stipend and jobs for those who Shun militancy. Madhya Pradesh Government raised Reservation Quota of OBCs from 14 per cent to ______ percent. Madhya Pradesh Governor Anandiben Patel approved the ordinance to increase reservation for Other Backward Classes (OBCs) from 14 per cent to 27 per cent, making MP the only state in India to have 27 per cent quota for OBCs. Saudi Arabia's state minister of Foreign Affairs, who recently visited India is _________. Saudi Arabia's state minister for Foreign Affairs Adel bin Ahmed Al-Jubeir met PM Narendra Modi in Delhi. Jubeir's visit to India comes days after his trip to Pakistan's Islamabad. Which of the following program did the Centre launch to eradicate polio from the country? Who was conferred Honorary Doctorate from the UN established University of Peace? Vice President Venkaiah Naidu was conferred Honorary Doctorate from the UN established the University of Peace. He is the first Indian to receive an honorary doctorate from the University of Peace. Which of the following foreign bank has come forward to extend a Rs 4,100 crore loan for Visakhapatnam Metro Rail project? Korea Exim Bank has come forward to extend a Rs 4,100 crore loan for Visakhapatnam Metro Rail project. Marshall Islands digital currency SOV to be released in 2019. ArcelorMittal receives NCLT nod for taking over Essar Steel at Rs 42,000 crores. Marayoor Jaggery, which received the Geographical Indication (GI) tag from the Central Government, is the traditional and handmade product from _______. The Marayoor Jaggery is the traditional and handmade product from Idukki district of Kerala. It recently received the Geographical Indication (GI) tag from the Central Government. DRDO successfully test fired the indigenously developed Pinaka guided rocket system at __________. Defence Research and Development organisation, DRDO successfully test fired the PINAKA guided WEAPON rocket system from Pokhran range in Rajasthan. Mohammad Shtayyeh is appointed as the Prime Minister of Palestine by its President Mahmoud Abbas. How many recipients were announced for the Padma Shri award, this year? The Padma Shri 2019 is awarded to 94 people, including actor Manoj Bajpayee, footballer Sunil Chhetri, choreographer and director Prabhu Deva, cricketer Gautam Gambhir, singer Shankar Mahadevan and freestyle wrestler Bajrang Punia. Actor Kader Khan will be awarded the Padma Shri posthumously. Which of the following famous personality received Padma Vibhushan this year? The Padma Vibhushan, which is India’s second highest civilian award after Bharat Ratna, was conferred to Larsen & Toubro chairperson Anil Manibhai Naik. The other recipients of Padma Vibhushan this year are folk artist Teejan Bai, Djibouti’s President Ismail Omar Guelleh, and writer and theatre personality Balwant Moreshwar Purandare. Are you looking for right place to enhance your Knowledge on Current Affairs of 12th March 2019 through effective Quiz section? 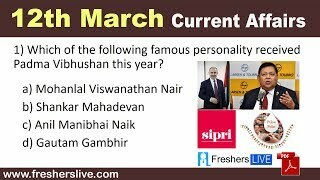 FreshersLive grants you the advantageous Current Affairs Quiz questions with accurate answers for 12th March 2019 which covers all the important events, supreme Awards, major occurrences in the National as well as World level. All important Current Affairs Quiz questions of 12th March 2019 are updated instantly in this page. Everyday at least 25+ Current Affairs Quiz Questions are displayed in this FreshersLive page. Correct Answer for each quiz question is given at the end of the entire 12th March 2019 Current Affairs Quiz questions section. You can estimate and upgrade your GK by attending these useful quiz questions. Entire quiz questions of 12th March 2019 Current Affairs covers Competitive Exam as well as Interview point of essentially important topics like International News, National News (ie. Indian Affairs), Science & Technology News, Environmental News, Bills & Acts Passed by Government, Defence News, About important Persons, Places, Banking & Economical News, Awards & Honours, Sports News, Revolutionary Updates on Arts & Culture, Obituary, Summits & Conference, Important Committee, Schemes, Appointments, Important Days & its Theme for Current as well as upcoming Year, Books & Its Authors, Agreements & MoUs, Budget, Taxes, Various Important Lists & Indexes, Visits by World Presidents, Prime Ministers, Political affairs and all Current Events. 12th March 2019 Current Affairs Quiz Questions updated in this page are prepared in the sense to help all aspirants to succeed in various Competitive Exams like UPSC IAS and other Civil Services Examination, Various Bank exams like IBPS PO, IBPS Clerk, SBI PO, SBI Clerk, RRB PO, RRB Assistant, Insurance exams like LIC AAO, UIIC Assistant, Railway Exams, Various Central Government Exams like SSC CGL, SSC CHSL, and more. Attempt all the Current Affairs Quiz Questions of 12th March 2019 and evaluate your score by matching your response with the correct answers mentioned at the end of this quiz questions section. By practising the FreshersLive Current Affairs Quiz Questions on a daily basis, you can surely succeed in the competitive exams as well as the interviews easily. Make use of this ultimate resource to the fullest and quickly achieve your goal!